Visual representation of carried weapons | Mods Forums - Mods for Far Cry, MGS & more! Simply a general question, and using the P416 as an example. When it's equipped with a suppressor it appears in Ajay's hands as if the suppressor has replaced the standard barrel, not been attached to the end. Of course as shown in the various menu displays, that's not the case. I took a quick look with FC3 (Ziggy's mod). There there's a slightly different presentation, with what could be considered a short part of the barrel shown, then the suppressor. Has there been any modification in the mod to how those weapons which do not have suppressors in vanilla, are shown when carried, with a suppressor attached? I understand how shown in-game does not effect performance parameters as coded. Hmmm I'm not nearly as versed on the weapon file formats as Ziggy (he's the Far Cry weapons master), but I think there may be an offset that needs to be adjusted in the weapon files for weapons that the suppressors weren't originally placed on. In addition I'm guessing another setting needs to be changed to not hide the barrel. By default it's probably working the way the heavy barrel does on the Magnum (hiding the short barrel and displaying the long barrel in it's place). Funny I never noticed it before. Simply to state that after using (i.e., walking and running) with both the M1A (i.e., vanilla MS16) and AK, that those weapons "look" correct in Ajay's hands as compared to the P416 - it just doesn't have the barrel length that the P416 should have. Again, isn't a priority, and most likely whatever code controls how a weapon is shown, might not even be available - as well as there being nothing within any of the code that could be adjusted in any event. Does this look basically the same in game in regards to the silencers position? Agree with willy regarding how the P416 w/ suppressor looks when the weapon is vertical, up against a wall. However my reaction is how the weapon is presented in the official printed guide and in the shop screen, both w/ & w/o a suppressor. Again not a priority, but when you run with that weapon you don't see near as much of what should be the barrel length as you do with the MS16 and AK, and when you compare how it comes across within the game, it's not the same barrel length as presented in the guide, nor in the shop screen, IMHO. This is a gun built in ~2009, by the Patriot Ordinance Factory Arms, Arizona, as a personal defence weapon for law enforcement use, and was offered to the US military in competition with the H&K 416 (The P416 lost). It's expensive, too. We also have no idea of the mechanical construction of any particular silencer used for that gun - Surefire, sHobbyAsia, etc.. - how is it possible to judge or comment on what is the "right" look for many of these weapons without knowing any of Ajay's purchased weapon specs? Is it really realistic to expect that a game programming company get involved in the research (and cost) necessary to verify and accurately show this kind of detail? Does it matter to the game? To someone who never even heard of "H&K" before this game? For most folks I suspect that "50 rounds of AR ammo" is not even thought about. Yes - I know there are some that do enjoy more realism (being a Brit I would love to see the FN SLR or a Sterling in the game) - hence Bontainer's shop changes, but do I really need to buy three rounds of 5.56mm - instead of just filling up etc.? Indeed - by that similar reckoning - should not this degree of "reality" then further extend to the availability of this weapon in Nepal? Should not this degree of "reality" then further extend to everything in Kyrat/Nepal? Outposts for e.g. - five to seven soldiers manning an outpost? Really? How long do you think they would last against twenty Golden path at night? Darned right (sic) we do Willy! Rabi Ray understood these things - all that sweating and chafing! Must be itchy as all hell! All very valid points. Thanks for the P416 background pj. Simply how this specific weapon is displayed when carried, in-game, nothing more. The original observation, which wasn't as clear as it could have been, was how a weapon is displayed while in the player's hands, can it even be changed in FC4? IIRC from Ziggy's FC3 Nexus postings that it was possible to change some aspect of how a weapon is displayed when carried. I think mostly it involved the sniper rifles in FC3. I apologize. I've been so busy with other stuff that this got relegated to the back burner. It's been "the lowest thing on the totem pole" so to speak. I took a quick (brief) look at the files and haven't adjusted any (plus or minus) on the P416 that should affect it's suppressor position from vanilla settings. I also tried loading various mods including vanilla (which btw only the bushman has a suppressor in vanilla) and to my extremely untrained eye the only issue I see is the angle of the gun (and the front sight being flipped down) makes the suppressor look like it covers almost the entire barrel, but (as pointed out) when you press up against a wall / use cover / etc the angle changes so you can clearly see there's an inch or two of barrel. Going by Greg's high res render above I assume the 3D model is intended to have very little space between barrel and suppressor. Comparing the screenshots I posted above - his render vs the bushman's store pic I do see a small bit of difference (besides the barrel length you can also see he has the front iron sight flipped down and they have it flipped up). Since he handed the models off to Ubi to do with as they wish, my thought is the Ubi devs simply setup the store model is a little different to make it look "better" or "cooler". 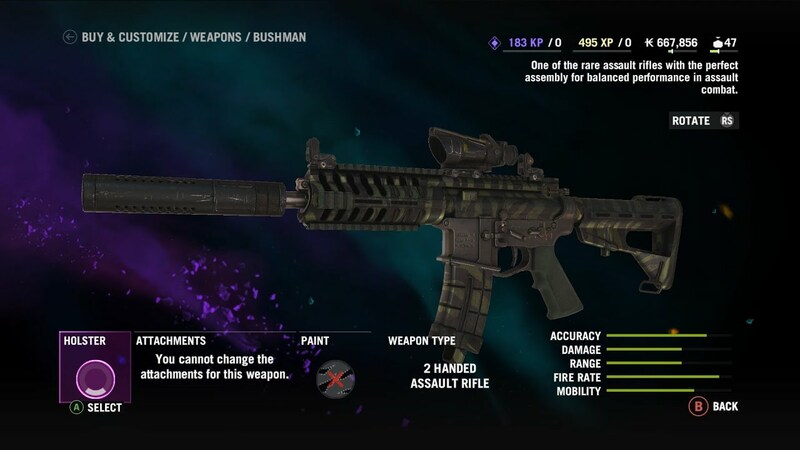 If you look at the Far Cry 3 version of the Bushman the suppressor is even further down the line and stuck smack dab on the end of the barrel... I suspect they compacted several weapons (look at the SA-50) in order for the shop screen to show them off more prominently. Far Cry 3 had many looonnnggg weapons that often had to be displayed at kind of weird angles or further away in the shop in order to get them all on screen. I think they did a much better job of presentation in Far Cry 4. I don't access to a printed copy of the manual (I bought digital - does it come with a pdf manual somewhere?!?) so I can't comment on what is displayed there.